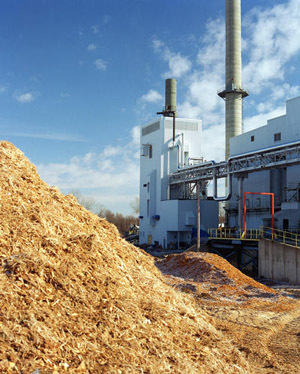 Biomass conversion technologies can be tailored for rural or urban environments, and utilized in domestic, commercial or industrial applications. A wide range of technologies are available for realizing the potential of biomass as an energy source, ranging from very simple systems for disposing of dry waste to more complex technologies capable of dealing with large amounts of industrial waste. Biochemical processes, like anaerobic digestion, can produce clean energy in the form of biogas which can be converted to power and heat using a gas engine or CHP systems. Anaerobic digestion is a series of chemical reactions during which organic material is decomposed through the metabolic pathways of naturally occurring microorganisms in an oxygen depleted environment. In addition, wastes can also yield biofuels, such as cellulosic ethanol and biodiesel, which can be used to replace petroleum-based fuels. Anaerobic digestion is the natural biological process which stabilizes organic waste in the absence of air and transforms it into biofertilizer and biogas. Anaerobic digestion is a reliable technology for the treatment of wet, organic waste. Organic waste from various sources is biochemically degraded in highly controlled, oxygen-free conditions circumstances resulting in the production of biogas which can be used to produce both electricity and heat. Almost any organic material can be processed with anaerobic digestion. This includes biodegradable waste materials such as municipal solid waste, animal manure, poultry litter, food wastes, sewage and industrial wastes. 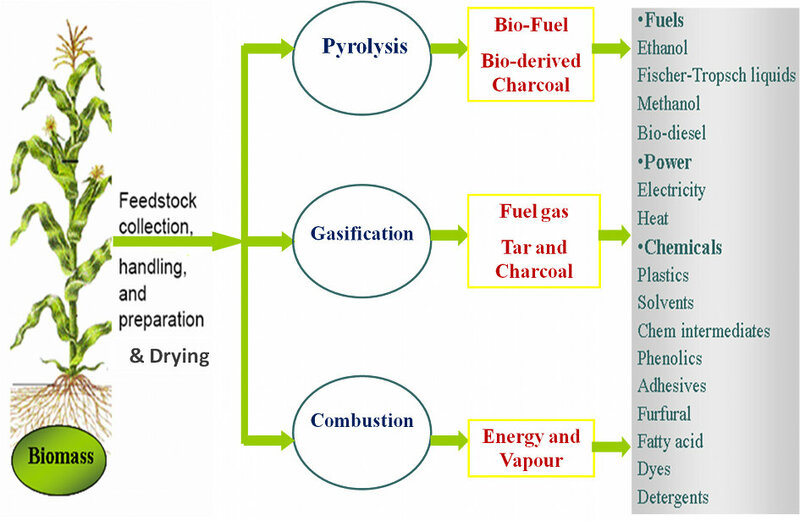 The three principal methods of thermochemical conversion of biomass are combustion in excess air, gasification in reduced air, and pyrolysis in the absence of air. Conventional combustion technologies raise steam through the combustion of biomass. This steam may then be expanded through a conventional turbo-alternator to produce electricity. Co-firing or co-combustion of biomass wastes with coal and other fossil fuels can provide a short-term, low-risk, low-cost option for producing renewable energy while simultaneously reducing the use of fossil fuels. Co-firing involves utilizing existing power generating plants that are fired with fossil fuel (generally coal), and displacing a small proportion of the fossil fuel with renewable biomass fuels. Gasification of biomass takes place in a restricted supply of oxygen and occurs through initial devolatilization of the biomass, combustion of the volatile material and char, and further reduction to produce a fuel gas rich in carbon monoxide and hydrogen. This combustible gas has a lower calorific value than natural gas but can still be used as fuel for boilers, for engines, and potentially for combustion turbines after cleaning the gas stream of tars and particulates. Pyrolysis is the term given to the thermal degradation of wood in the absence of oxygen. It enables biomass to be converted to a combination of biochar, syngas and bio-oil. Pyrolysis technologies are generally categorized as “fast” or “slow” according to the time taken for processing the feed into pyrolysis products. These products are generated in roughly equal proportions with slow pyrolysis. Using fast pyrolysis, bio-oil yield can be as high as 80 percent of the product on a dry fuel basis. Bio-oil can act as a liquid fuel or as a feedstock for chemical production.